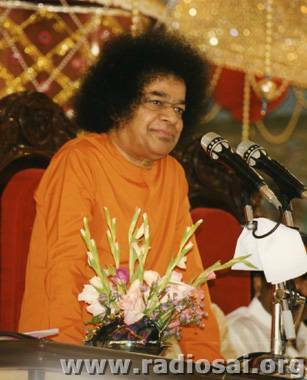 For those blessed enough to be present during Swami’s Birthday festivities the preceding days provide a feast of culture in the form of dramas and musical performances by renowned artists. The whole world is represented in the crowds that flock to join the celebration of the birth of the God of Selfless Love. As the 23rd arrives everyone’s hearts expand in great bliss and excitement. 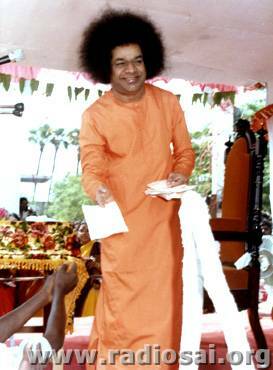 During the Divine Discourse the devotees imbibe the theme-note from the Lord - guidance to treasure, ruminate upon and practise throughout the year. 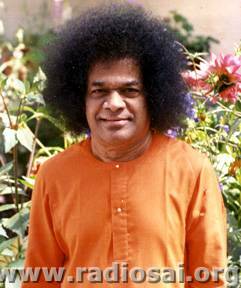 The discourses are supercharged with Bhagavan’s ardour to guide His devotees away from the pitfalls of human life. He has often repeated that it is not necessary to drink the whole ocean to know its taste, that it is not necessary to read all scriptures to live a life of joy, peace, and love. It is enough to put into practice one aspect of spiritual teaching. In that light and to celebrate Bhagavan’s 80th Birthday, Heart2Heart brings you selections from previous Birthday Discourses for your spiritual delight and inner edification. Your virtue, your self-control, your detachment, your faith, your steadfastness: these are the signs by which people read my glory. You can lay claim to be a devotee only when you have placed yourself in my hands fully and completely with no trace of ego. You can enjoy the bliss through the experience the Avatar confers. Realizing the Lord within you as the motivator is the task for which He comes in human form. You may benefit from God, but you cannot explain Him. Bring something into your daily practice as evidence of your having known the secret of higher life from me. Show that you have greater brotherliness. Speak with more sweetness and self control. Bear defeat as well as victory with calm resignation. I am always aware of the future and the past as well as the present of every one of you, so I am not so moved by mercy. Since I know the past, the background, the reaction is different. It is your consequence of evil deliberately done in the previous birth, and so I allow your suffering to continue, often modified by some little compensation. I do not cause either joy or grief. You are the designer of both these chains that bind you. Many of you come to me with problems of health and mental worry of one sort or another. They are mere baits by which you have been brought here. But the main purpose is that you may have grace and strengthen your faith in the divine. But I call you to me and even grant worldly boons so that you may turn Godward. No Avatar has done like this before, going among the masses, counseling them, guiding them, consoling them, uplifting them and directing them along the path of satya, dharma, shanti and prema. Cultivate nearness with me in the heart and it will be rewarded. Then you too will acquire a fraction of that supreme love. This is a great chance. Be confident that you will be liberated. Know that you are saved. Many hesitate to believe that things will improve, that life will be happy for all and full of joy, and that the golden age will recur. Let me assure you that this dharmaswarupa, that this divine body, has not come in vain. It will succeed in averting the crisis that has come upon humanity. The 23rd day of November, which you now honor as the day on which I was born, is only like any other day if you celebrate it in a routine, ritual fashion. Adore man; the adoration reaches Me. Neglect man; you neglect Me. Of what avail is it to worship the Lord and to suppress man, His counterpart? Love for God must be manifested as love for man, and love must express itself as service. Through love alone -- love acquired through spiritual discipline and shared with all as spiritual discipline -- can peace be attained, by the individual as well as by the nation. My Life is My Message and My Message is Love. That explains why you have gathered hither in hundreds of thousands. You celebrate the birthday of Bhagavaan. But do you follow the teachings? You will experience the fruits of celebrating the birthday only when you follow the teachings. Jesus said: "Love everyone." Christmas is celebrated, but how far does one practise love? None at all. There is love in everyone's heart. Share it at least with ten persons every day. This is seldom done. People are more keen on receiving than on giving. They are willing to give away only things, which they do not relish. There is no sacrifice in this. 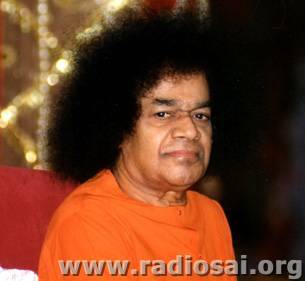 You should not be concerned with how many have come for Swami's birthday but how many are following Swami's teachings. If every devotee is able to influence two persons, soon the whole world will be reformed. Embodiments of love! There is only one thing you have to offer to Me today. Pray that people in all countries, may the entire humanity, should be happy and at peace. "Lokaas samasthaas-sukhino bhavanthu" (Let all the worlds be happy). Then alone there will be real unity. Do not wish solely for the peace and prosperity of India alone. Pray for the welfare of all countries. All are our brothers, whether they are in Pakistan or America or elsewhere. 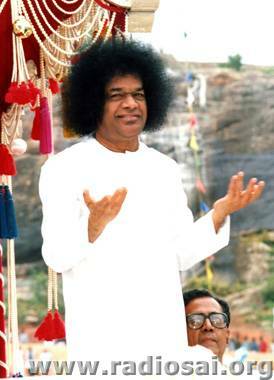 Today as an offering to Swami, give up meat eating, consuming liquor and smoking. By renouncing these three, you will benefit yourselves as well as society and the nation. 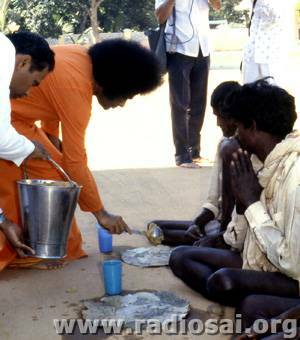 If you wish to carry out Swami's aim, renounce from this moment itself these three bad practices. Do not put it off to tomorrow. Take the resolve from this moment. Expecting that you will carry out Swami's wish and thereby promote the well being of your family and the nation, I bless all of you. It is the 70th birthday of this body. You have to know one important thing. Swami does not need anything. He does not expect any dress. Swami belongs to you. Swami is not separate from you. You are not separate from Swami. That is the intimate relation between Swami and you. Right from this day our organization should expand and spread all over the world. We should forget individual differences; keep in view the welfare of the society. The welfare of the society is our welfare. Let it be in any village, region or country, we should participate in all activities in all areas, regions and countries. Today this body enters on its seventy-first year. This body is made up of the five elements and is essentially impermanent. Do not attach much importance to the body. Take to heart the Love principle that is being conveyed to you. My entire life is filled with love (cheers). I have never put anyone at any time to any kind of suffering. I have never done any harm to anyone. I have hated no one. I have no aversion to anybody. What is the reason? It is my love that is transforming others. I am now seventy one. But no one can know what accounts for my condition. Some may ask why they are not attracted to Swami if that magnet is so powerful. The reason is that these persons are like rusted iron which no magnet can attract. Let them remove the rust and dust and they will be drawn to the magnet. Their hatred and desires, their envy and greed are the rust and dust covering them. If you cleanse yourselves of these, wherever you are, you will be mine and I will be yours. The hapless and the forlorn, wherever they may be, are the concern of Sai. Promote sacred love in your hearts. That love will not only redeem your lives but will promote the well-being of all around you. Keep your association with anyone to the barest minimum. Genuine spiritual aspirants should be particularly careful in eschewing bad company. They should create an environment conducive to their spiritual progress and mental peace. That is the only thing Swami wants. Having come to Prasanthi Nilayam, all of you must become exemplary devotees. Outsiders must feel spontaneously how exemplary is the behavior of Sai students and Sai devotees. That reaction will do you more good than satisfying Me. What does the word 'Bhagavan' mean? 'Bha' represents effulgence. 'Ga' signifies the one who radiates effulgence and 'Va' symbolises the power to propagate effulgence. 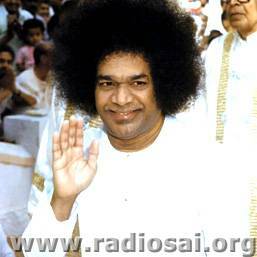 Therefore, 'Bhagavan' is one who spreads the shine of effulgence everywhere. He has no form of any kind. 'He is subtler than space and the atom.' How can you attribute any form to such a One? He fills the entire universe, but is not attached to anything. 'Brahma' - God is in you and you are in 'Brahma.' Since we see duality in such non-dualistic principle, we suffer many sorrows. Though He has no particular form, all forms are His. You need not undertake any difficult spiritual practices to attain Divinity. You need not fast or do any chanting or meditation. Love Him from the depths of your heart. Devotees want to offer many types of service to God. These are the characteristics of faith. When you have such faith, you should not sully your sacred body by partaking wrong food. Gradually, you should intensify your love for God, fear of sin and morality in society. Morality rules the society only when people have love for God since fear of sin follows it.